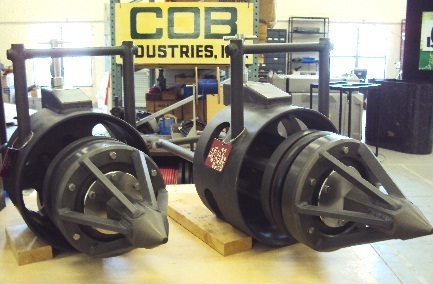 COB Industries, Inc. manufactures custom engineered ROV plugs for offshore subsea pipelines. ROV Pipe Plugs are designed to be ROV-operable, meaning they must be built so that underwater Remote Operated Vehicles (“ROV’s”) can handle, install and manipulate them. The plugs incorporate mechanically actuated seals and one version also has a “guide cone” on the front to help guide the plug into the pipe while being controlled by the ROV arm. COB was first contracted by BP to build ROV operable plugs in 2007 and has expanded this business steadily over the last few years with repeated orders from offshore oil platforms.